The Shuar indigenous people represents one of the most prominent ethnic group in the Amazonian Region, with around 35 000-40 000 living mainly in the Ecuadorian provinces of Pastaza, Morona Santiago and Zamora Chinchipe, in the southeast of the country. 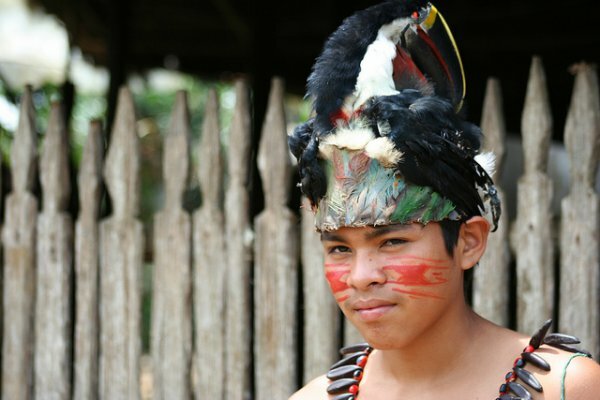 Shuar is both the name of the community as well as of their language, which belongs to the Jivaroan language family. Preserving an abundant and rich cultural legacy, the community’s religion and beliefs system is based on respect for the nature and for their ancestral lands. The Shuar were first contacted by Spaniards in the century. Against a history of colonization, In the 20th century the Shuars reorganized themselves into small settlements called centros. The Centros initially facilitated evangelization by Catholic missionaries but also became a means to defend Shuar land claims against those of non-indigenous settlers. In 1964, representatives of the Shuar centros formed a political Federation to represent their interests to the state, non-governmental organizations, and transnational corporations. Five years later, the Federation signed a deal with the Ecuadorian government in which the Federation assumed administrative jurisdiction over the Shuar reserve. Since 2000, Shuar’s ancestral lands have been assigned for copper mining concessions “for the sake of development” and, as a result, indigenous communities have suffered persecution and violence. The expropriation of the Shuars’ lands and resources has forced the indigenous community to fight off industrial-scale, copper mine and oil extraction and threats to their lands and way of life. Resorting to peaceful marches, legal actions and by launching an international pressure campaign, the Shuars were able to keep several oil companies from drilling on their lands and disrupted Quito's plan to launch a bidding round for a new oil blocks on their lands. Nonetheless, Amazon land battles still persist. Under Rafael Correa’s presidency, several indigenous communities were forced to leave their lands and numerous rights violations took place throughout his mandate. In the territory of the Shuar, a 25-year concession was given to a Canadian company, later bought by the Chinese Exsa - property of the Chinese State companies CRCC and Tongling. Conflicts erupted between the indigenous community and the police/military when a group of Shuar attempted to recover their lands from the Chinese company. Three indigenous people and a police officer were killed and many indigenous were arrested – of which some are still under detention. A state of exception - which was only revoked few days before the 2017 presidential elections - was imposed by the government on 14 December 2016, which led to even stronger oppression against the communities. Although current president Moreno seems to be more open for dialogue, the Shuar movement wants to create political and diplomatic pressure for the respect of human rights and protection of the environment and ancestral lands in Ecuador. According to their beliefs, their lands are inherited from the past generations and borrowed from the future ones, and therefore need to be protected from degradation.